Young Mary Faber is just eight years old when both her parents die of "the pestilence" and she's left to fend for herself. She finds a place with a gang of urchins, begging and stealing to get their daily bread. But Mary wants more than this life and when her gang's leader is killed, she disguises herself as a boy and sets off to make her own way. One reason I love vacations is that long car trips give me an excuse to listen to audiobooks (yeah... Abby = geek, what else is new?). 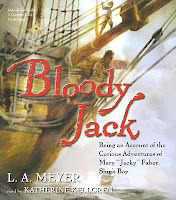 Traditionally I have picked out shorter recordings (my long drives are never all that long), but I was anxious to check out Bloody Jack since it won an honor in the first ever Odyssey Awards this year. I wasn't at all disappointed! Katherine Kellgren's narration makes this recording a joy to listen to. Her expressive reading gives Jacky a real voice and brings all the characters to life. Each character has a distinct voice, different from the narrative voice, and Kellgren's accents are a delight. I'd hand this to fans of The True Confessions of Charlotte Doyle and maybe Tamora Pierce's Lioness quartet.